Firstly I would like to clarify a few things with regards to the osprey and the mallard scenario reported in last weeks blog. There was a lot of confusion around whether EJ was mobbed by a mallard, and it turns out that she WAS. Pesky ducks. 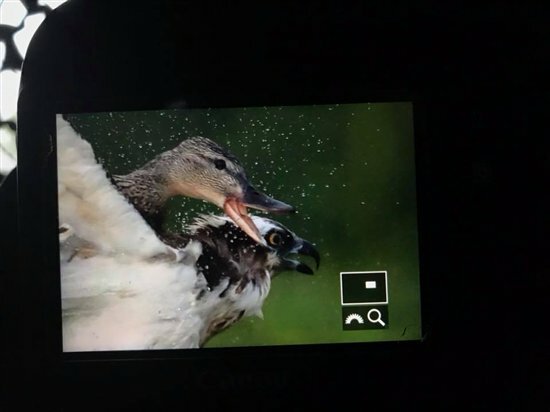 The photographs published showed an unringed osprey, but it turns out there were a few angry female mallards around and EJ got her fair share of abuse from them! 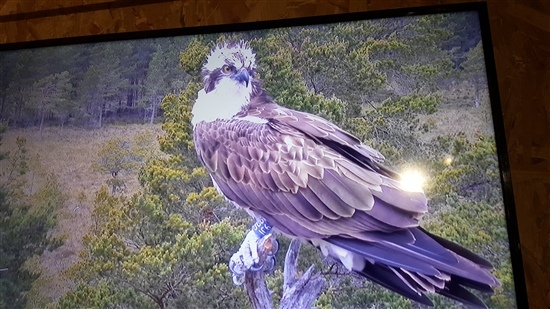 In the past seven days we have seen at least FIVE different opsreys around the Loch Garten nest. Obviously the wonderful White EJ, who has been gracing us with her presence for the last 16 years! George has been around almost every day, and got pretty close to EJ on her perch. I think he was probably just after a chunk of her fish, which she absolutely was not keen on sharing! Blue NF2 landed on the camera tree and EJ's nest at around 11:00hrs last Friday (22nd). George, EJ and Blue NF2 had a bit of a stand-off on the nest as you can see from the photograph below. 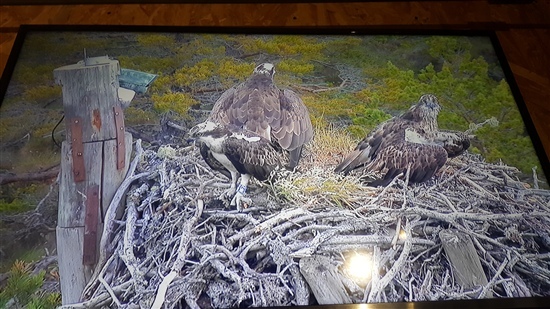 EJ flew to her favoured perch, with George to follow and Blue NF2 left on the nest. Eventually he followed suit and joined them on the perch... doesn't he understand that three's a crowd?? Later on that day, once George and Blue NF2 had flown off, a fourth osprey turned up - this time Blue JC6! He landed on the camera tree for a short while, with EJ mantling he didn't stick around very long! On Monday (25th) EJ had to deal with yet another intruding osprey, but lets face it, she does have a pretty decent patch! This time we think a female, White DP. All we know so far about White DP is that she was ringed in Scotland. They were both dive bombing each other right in front of the visitor center! 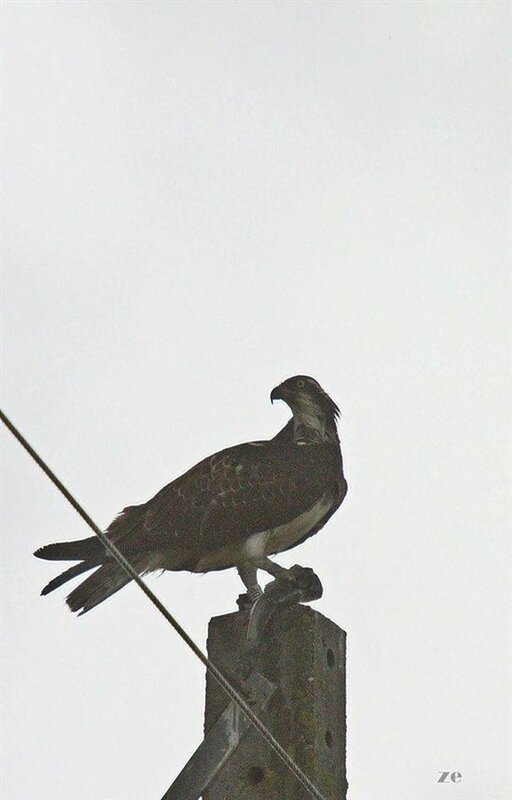 As always, our girl EJ, a strong independent osprey, managed to see off intruding White DP! White DP, image taken in Portugal in 2016. Thanks to Valerie Webber for sharing on Facebook. Today there was another invasion, by an unidentified intruder, who was flying really high above the nest. EJ and George were on the nest alarm calling, before George went off to chase the intruder away! We can usually find out roughly where birds hatched and how old they are, however at this time of year many ringers are busy ringing (as the title suggests). We will keep you all up to date if/when we find out more about our most recent visitors to the nest. Who knows? Maybe there will be more? Maybe the same intruders will return for round two? Never a dull moment here at LG. As always, thank you all for following!